Looking for a family (ok really dad) DIY project for the weekend? 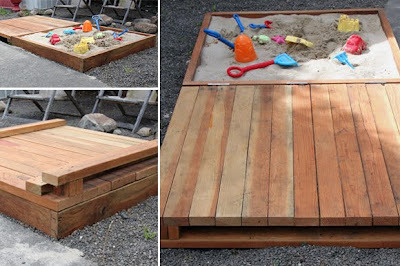 How about this custom sand box featured on At Home with Kim Vallee this week? I challenge one of you readers to make this (we don't have a yard or porch so can't fit one and live just steps from the beach), but would love to see some "real photos of your project! The original builders of this project were Carla & Jason from Small & Friendly.